Adobe today launched Creative Suite 5.5. With it comes the new Photoshop Touch Software Development Kit that facilitates the creation of apps for smartphones and tablets that can talk to desktop Photoshop app. This opens interesting possibilities and Adobe announced three new iPad apps built using the new SDK that showcase several scenarios. Called Adobe Eazel, Adobe Nav and Adobe Color Lava, these programs will land on the App Store next month, priced between two to five bucks. Check out a video demonstration and brief app descriptions right below the fold. Adobe Eazel is a finger-paint program that lets you sSend your artwork directly to Photoshop CS5 from any location, provided you have a network connection between your iPad and a computer. As the name suggests, Adobe Nav lets you view Photoshop documents on your iPad as well as customize the Photoshop CS5 toolbar on iPad to easily access the tools you use most. You can browse, reorder, view and zoom in on up to 200 open Photoshop documents on iPad, tap a document on iPad to make it the active document in Photoshop CS5 and more. Adobe Color Lava is when you need to mix colors and create custom swatches on your tablet. 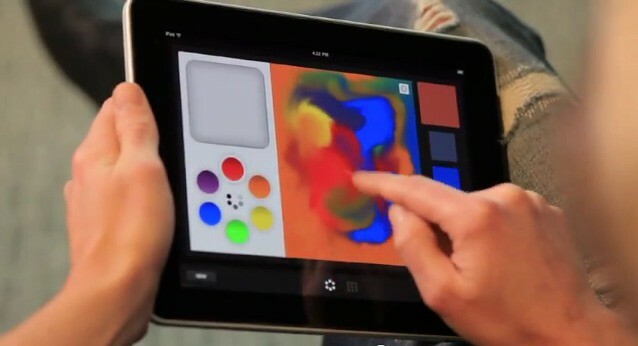 Anything you create on an iPad is instantly available in Photoshop CS5. Adobe has detailed all three apps in cool videos, but we couldn’t embed them here so you’ll have to follow the links. Note that those apps don’t seem to be related to a new Photoshop Express app with layers Adobe recently demoed at Photoshop World. Included below is a promo clip that kinda sums up the idea of interacting with Photoshop CS5 via tablets.